Ah, coffee in the morning what could be better? How about coffee and chicory? Adding chicory to coffee is a New Orleans tradition since time immemorial. It started during the French Revolution when coffee imports were less due to the British blocade so the French took to roasting chicory, a native of the endive family, grinding it up and adding it to coffee. It added a sweet flavour and has a laxative quality when drunk in larger amounts. Here we have an Ad from 1958 for Eight O'Clock Coffee. I always thought of it as the "store band" for A&P Supermarkets since that was where you could buy it. 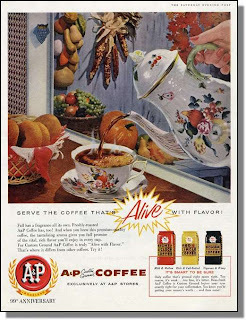 When I was a kid I remember my grandfather shopping at A&P and at the end of each checkout lane was a coffee grinder. I was always so fascinated with it as it ground the beans and remember well the heady aroma of fresh ground beans. Time pushed forward as it always does, and A&P went the way of so many old time grocery stores, consumed in a gluttonous devouring by Safeway. Eight O'Clock Coffee disappeared from the pantry for over 2 decades. All was not lost however, as Eight O'Clock Coffee found it's way back to consumers. Dad and I get our from BJ's Wholesale Club and grind it at home. It is still a delicious coffee with medium acidity and a good amount of fruity undertones. We mix it with Community Coffee Ground Chicory as follows: 1 Scoop Ground Coffee for every 2 cups wanted, 1 Scoop Ground Chicory for every 3 scoops coffee. This is almost Cafe du Monde style coffee that I remember so fondly from my trip to New Orleans. It's actually a cool and helpful piece of info. I am satisfied that you shared this helpful info with us. Please stay us up to date like this. Thank you for sharing. I like the helpful info you supply on your articles. I will bookmark your blog and test again here frequently.